﻿ Golden Gate Hotel and Casino, Las Vegas (NV) | FROM $23 - SAVE ON AGODA! "I will say the value here was great." Have a question for Golden Gate Hotel and Casino? "It's a very good place to stay for travel. Very good location and convenient. But a little bit noisy in the night. All in all, it's good." "Location is great being on Fremont street where i spend most of my time." "Overall, I had a good stay." "Would definitely stay here again"
Established in 1906, this family-owned hotel features an intimate and friendly ambiance reminiscent of Las Vegas in its earlier period. It's located right on Fremont Street, the most vibrant street scene bustling with street performers, specials events, and free concerts. 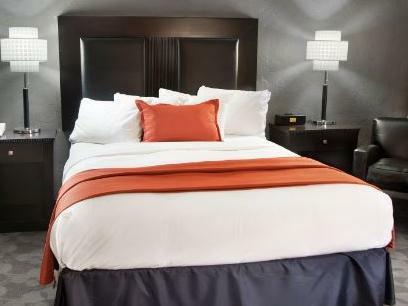 Named the Best Downtown Hotel by the Las Vegas Review Journal, guestrooms stay true to its heritage, yet offer modern conveniences. As for dining, guests can't miss the Shrimp Bar & Deli which serves Las Vegas' original shrimp cocktails with a secret sauce. The hotel also features a welcoming casino with a new slot floor with favorites like Monopoly, Wheel of Fortune, and Mega Bucks. 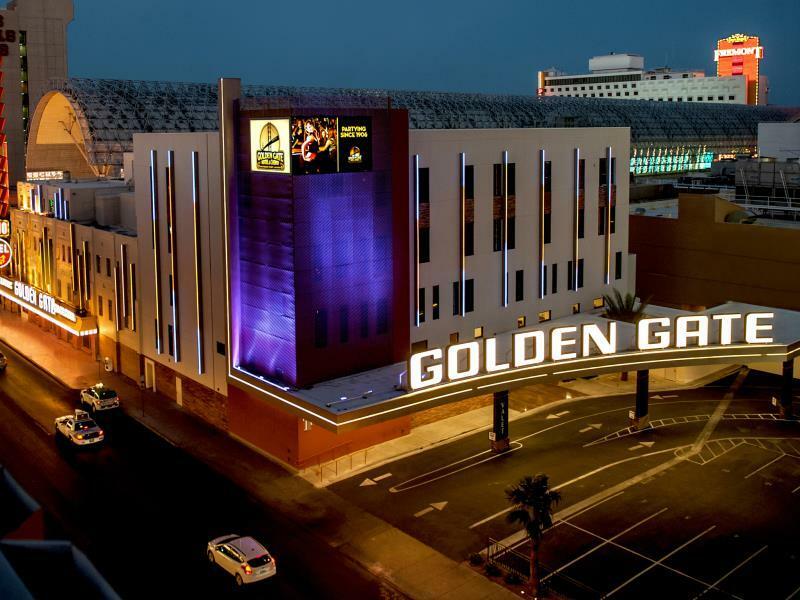 Golden Gate Hotel and Casino is surely a perfect choice for a memorable stay in Las Vegas. "Strategically located in downtown Las Vegas." Maximum capacity of total guests in a room is 4. Please note that the hotel has a maximum stay of 14 days. One child under 18 years stays free of charge when using existing bedding. A security deposit of USD 100 is required upon check-in for charges or damages during the stay and will be refunded upon departure. Hotel location was excellent, right at Fermont St, and a quick bus ride to the strip. Dupar restaurant was excellent! Hotel staff courteous. Room is small but clean and comfortable, but the noise from FSE can be loud if booked in low floors. There is no free wifi and the hotel charges resort fees even if there are no resort facilities. It not be a hotel. Just some rooms over a casino. Rooms are very small, old, dark, lack of amenity and uncomfortable Staffs are unprofessional I really think it just be some free beds for gamblers who overnight played in the casino. No coffee, no room service, housekeeping never touched my room. Was told I could have a view which would be noisier or a quiet inside room. Chose quiet. Room had the largest air conditioning unit right outside my window that ran day and night. Outlet in bathroom did not hold a plug plus across the room from “vanity”. Shower was either cold water or scaulding hot. Nothing in between. $25 per day resort fee......for what??? For the price of the room I didn't mind the tiny loud room but when I realized it didn't have basic accommodations such as a coffee pot or blow dryer in the room is was very disappointed. Not sure what the $84 resort fee is for they don't even have a pool. Strategically located in downtown Las Vegas. The Fremont street is in fact at its doorstep. Greyhound bus terminal is just a stone throw away. Public transportation station such as Deuce and SDX buses that ply The Strip are just few yards from the hotel. Though the hotel is not that new but the room is clean and basic amenities are provided. I will say the value here was great. We only stayed one night. Location is great being on Fremont street where i spend most of my time. Room is small but cute. Didn't spend much time in room by trying to sleep was aweful. We got back to our room about 1:30am and the noise was extremely bad. Perhaps the location of the room was the problem. Our room was on the corner near Fremont street. It sounded like we were right by the stage. The noise didn't calm down till almost 3 am on a Sunday night. The lights were brought but the curtains did a decent job of blocking the light. The other huge issue for me was the ac or whatever it is they have there. A sign above the control says it only blows cool air in the summer and warm air in the winter. Our room was cold even with the unit off. So for me i wouldnt stay again. Perhaps if in a room not near Fremont street or bring an extra blanket and you will be ok. The room was a little too close to the outside music (didn't bother me), but too far from the elevator (I had too many carry-on bags) and I would have loved a coffee maker in the room (no room service). A very nice place. I would stay there again. Enjoyed the comfy bed and the cozy room. As I am not much of a gambler, I cannot tell you too much about the casino, but it seemed nice. Not too big - good if you want to have a peaceful Las Vegas experience. There are not many issues with this hotel. The room was a little dirty, but I still clean. I felt a bit cramped, but for what I was paying, I am happy. Big plus for this hotel, it is not mentioned, but there is complimentary internet in the rooms. The casino in the hotel was very friendly and a great atmosphere. The Freemont Experience is way better than the strip and it is not as crowded. I recommend it here in Las Vegas. Pawn stars and the mobster museum are close to this area and are a must when visiting. Enjoy!!! clean rooms, friendly staff,great location. All was good. But if you stay in a front room, facing Fremont st, don't expect to bed down in the evenings until the street band is done playing:: 2:00 AM. There was loud speakers 10 ft from my windows. Open your windows to have that nearby speakers 10 plus on the volume scale!! in your room. Like front row seats to the band. I just needed a "cheap" one night hotel stay to bridge my LAS flight before check-in to my Wyndham Resort reservation! However, this Las Vegas downtown hotel is very old & "worn out" and seriously in need of a renovation? Luckily I was able to get a room opposite The Fremont Experience Street so it was less noisy at night BUT My Agoda hotel reservation did not clearly state there was an additional $20 PER DAY resort & high speed internet fee when I checked out!! There are better places to stay for less money! The location allows easy access to fremont street attractions. There's a lot of historical touches to this hotel. Du-par's restaurant makes great pies and pancakes. Was here for one night. The hotel added suites a couple of years ago so this was a relatively new room. Good sized suite with a great sectional for seating and very comfortable bed. Standard hanger space but lots of drawers for storage. Big flat screen tv. The suite faced away from the fremont street experience so it was quiet. The casino was good but they do play the music louder than I've noticed in other casinos. Good selection of games. Du-par's is a great diner type restaurant in the casino. Unfortunately, there is no room service. The hotel only has 160 rooms on 5 floors so it's a boutique hotel lacking some of the bells and whistles you get with bigger places but it's so close to anything you'd need, it's not an issue. The only issue I would suggest a fix for is the elevators. They have one elevator and it's slow. Still, I look forward to returning to the Golden Gate. Such a great experience since we arrived. Friendly & helpful valet, checked-in early because rooms were available- awesome; and we were give the option of a room with a view without an upgrade fee....who does that now a days. The windows actually open out like the old days so so cool, spacious bedroom with cable and free internet services. The bathroom was a little small but who cares. The feel of the hotel was like an old sixties vibe- it almost felt like were there. I would definitely stay here again. It was a great trip as always. Golden Gate has $5 craps with 10x odds decent BJ tables and hot dealers. I love the 3rd floor overlooking Freemont and the stage. Windows open wide right onto the street. It's loud but who sleeps in Vegas anyway? The decor...the staff is great!.....the beds are soooo comfortable! The whole place was great! The staff was wonderful from the hotel and the casino part....front desk, housekeeping, waitresses, dealers.....the decor is so cool! Like 30-40s Vegas but updated....LOVED IT!